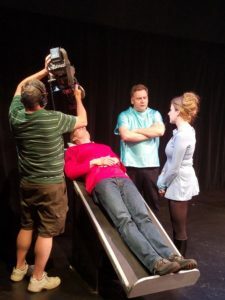 On Wednesday, June 8, Saint Bryan from King 5’s Evening Magazine joined us on the bridge of our Starship Enterprise to take a behind-the-scenes look at the 5-year Seattle perennial hit Where No Man Has Gone Before, an improvised parody of the original Star Trek Series. Thanks for the great time, Evening Magazine! This entry was posted in Announcements, Behind The Scenes, Performances, Press, Where No Man Has Gone Before. Bookmark the permalink.